How do you pick the best photograph? I specialize in capturing your dogs soul in the drawing and since the eyes are the windows to the soul; make sure the eyes are clear in the photo. A good photograph is paramount in order to produce a drawing that perfectly resembles your dog. Preferably, choose digital photograph(s) or a scan of a paper photograph. Send the original photograph or scan by email in its original format/size. I have a large inbox and can accept any size of image! If you need any help just let me know. I will only attempt a drawing if the original photograph(s) are of sufficiently detailed quality. For more information please visit my blog post with tips on how to create the perfect picture here. 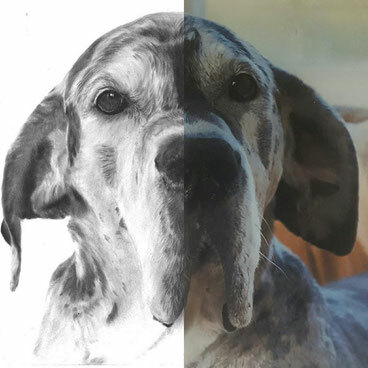 Once I have checked the photograph(s) are of suitable quality and in order to start the dog drawing, I will require a non refundable deposit of $50. Deposits are payable through PayPal or via bank transfer. On the date payment is cleared, your commission will be established on the ‘first come - first served’ waiting list. I will also, at this time, send an official confirmation of the commission via email. Will I see the work in progress? Whilst working on your dog's drawing, I will send photograph(s) of the work in progress. That way you can see how your dog's drawing came to life. What will happen when the portrait is finished? On completion of the dog drawing I will email a high quality scan of the finished drawing with an Art by Talitha watermark and let you know the amount of the outstanding balance. On the date payment is cleared I will arrange delivery. You are only allowed to share the scanned image of your dog drawing on the internet with reference to Art by Talitha. What happens if I'm not satisfied with the finished drawing? I promise that if, on presentation of the scan of the completed dog drawing, you are not satisfied, no further money will be due and the drawing will remain my property. The deposit will not be refunded, because of the material used and time spend. The dog drawing could however be used for PR-purposes. Time from start to completion for my dog drawings is approximately 30 hours. The start date is determined by the number of commissions on the waiting list. Unfortunately I still work a full time job and I can only work on your dog portrait in my spare time. This means that each commission will take about 1 month. Should you have a question to which you can't find the answer on this website? Or do you have all your questions answered and are you ready to order your dog's drawing?